Giverny is a 45-minute train ride west of Paris, on the edge of Normandy. The small city of Vernon is the closest you can get by train, but tour buses waiting at the train station can take you and any little ones in tow the rest of the 15-minute trip to Giverny. I took the earliest train, which is an advantage if you want to catch the beauty while beating the crowd! I also needed to return to Paris by late afternoon to meet a friend but renting a bike would have been a beautiful way to enjoy the scenery along the way. Giverny is a narrow, almost one-street village that seems virtually unchanged since Monet's time except for a sleek new museum and a handful of quaint art boutiques. I found Monet's home and garden at the end of a simple road, but even this short walk was stunning, following a meandering stream and spring flowers. Monet's garden itself is breathtaking! Nearly every bit of ground seemed to be blooming, even in early April. Above all, there were so many tulips, but also Narcissus, Daffodils, Pansies, and bursts of sweet colors everywhere. You can walk south of the main garden to the pond, which inspired Monet's famous water lilies paintings made when he was in his last years, losing his eyesight. Today, children up to age 7 can visit the garden for free, which is wonderful. I can't wait to bring my children to this garden someday soon, because it's really the place of dreams--at least before the high tourist season! Honestly, I suspect Giverny is more stunning now than it was in Monet's time. I saw multiple gardeners working while I was there, including some young teens learning how to care for the garden beds. It was sweet to see them alongside the more experienced gardeners! Monet's family home is also open to tour (included with the garden admission fee), and it offers a beautiful glimpse of the decor of a well-to-do family home circa 1870. Half a million visitors come to Giverny each year now. I don't blame them--the beauty is inspiring! Monet's home has vibrant green trim--it's so daring but somehow it works! The interior is long and trailing; the creaky narrow stairs contrast with its high ceilings and airy bedrooms. 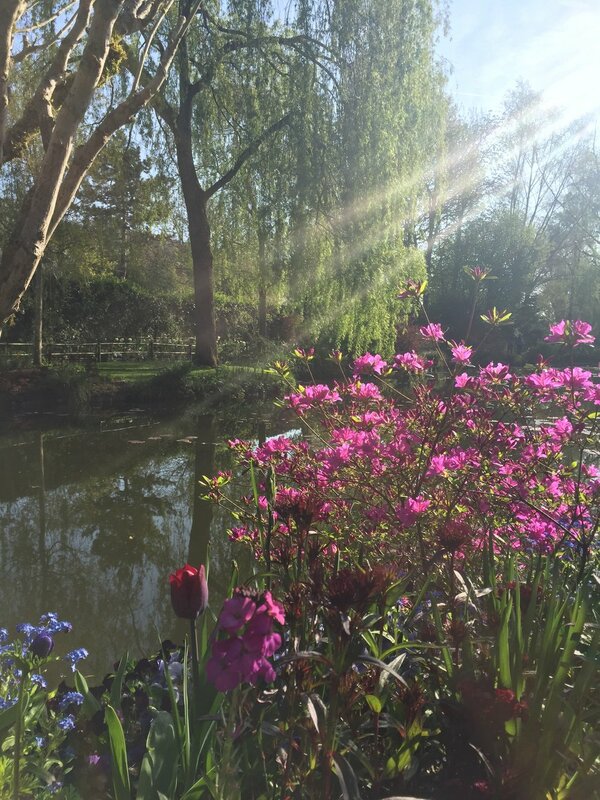 Overall, I was thrilled to have finally visited Giverny and found it as beautiful and inspiring as I had hoped. Add it to your bucket list if you haven't had a chance to visit there yet! Also, in connection with gardening and art, I wanted to mention how sweet these Garden stamps are that we got at Easter from Princeton Architectural Press. The set includes 25 stamps and two tiny ink pads in green and pink. Designed by Coralie Bickford-Smith, the stamps are intended as little building blocks for creating plants and flowers. My children and I enjoyed creating unique flowers using one stamp to overlay another. It was a bit tricky not to push too hard and get the stamp block outline, however! One other caveat: Take a photo of the original stamp layout in the box before you start so you can fit them all back in when you are done. Aspiring artists little and big will like PA Press' architectural Stampville stamp set too. It's designed by French artist Aurélie Débat. I encourage my three-year-old to wipe his stamps on a damp paper towel before changing ink pads to keep the ink colors from blending. I think Claude Monet would have rather liked the watercolor results! What are your garden goals this spring? Do you have a garden that you love to visit?